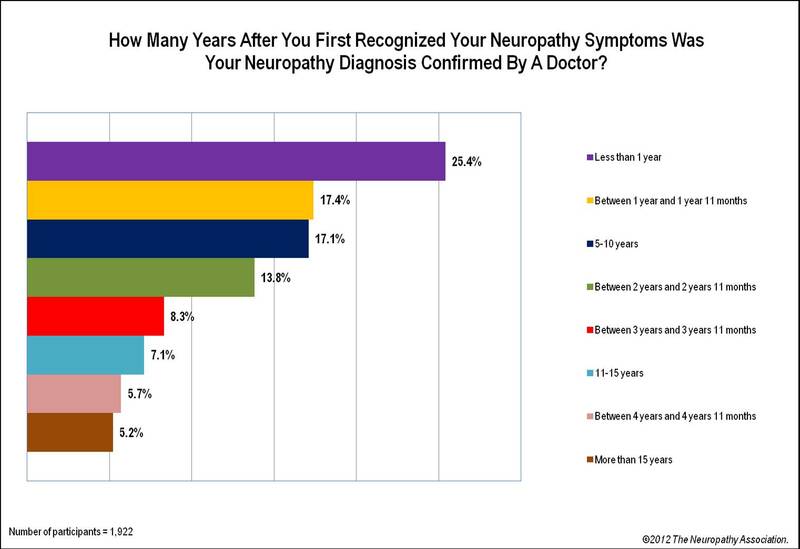 A new national Neuropathy Association poll of peripheral neuropathy patients finds that the majority of respondents experience an extended period of time from symptom onset to diagnosis of their neurological disease, with 57% taking two or more years to receive an accurate diagnosis. In addition to facing delays in receiving a diagnosis that might help prevent disease progression and provide early access to appropriate care and treatment, close to 50% of these patients have been told their neuropathy is “idiopathic” (of an unknown cause). 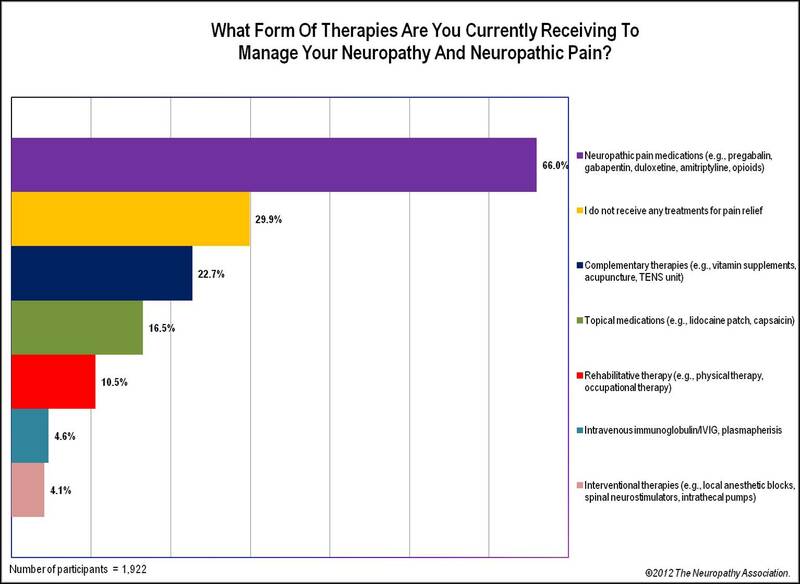 A large majority—70%—of patients experience chronic neuropathic (nerve) pain for which they use multiple therapies, and nearly half say they are challenged in coping with neuropathy’s impact on their overall well-being and quality of life. “With the potential for millions of Americans to suffer from neuropathy’s progressive chronic pain and disability, the U.S. is currently unprepared to face a major public health crisis if healthcare providers, the media, and public policy officials continue to ignore the inadequacy of medical resources and research funding for neuropathy,” observes Tina Tockarshewsky, president and CEO of The Neuropathy Association. Peripheral neuropathy, or “nerve damage,” impacts over 20 million Americans (or 1 in 15), making it one of the most common chronic diseases and a leading cause of adult disability. Neuropathy results from injury to the peripheral nerves, disrupting the body’s ability to communicate with its muscles, organs, and tissues. With early diagnosis, it can often be controlled and quality of life restored. If ignored, symptoms can intensify to loss of sensation, weakness, unremitting pain, and/or disability. The Neuropathy Association’s national survey of 1,922 patients asked about the length of time between symptoms and confirmed neuropathy diagnosis, revealing 57% took two or more years and 43% took less than two years to diagnose. “While early intervention and treatment can be critical to slowing disease progression, our biggest challenge is many Americans still do not know about neuropathy, are unaware they have it, and do not recognize warning signs. Too often neuropathy is discovered after irreversible nerve damage has occurred.” notes Dr. Thomas H. Brannagan, III, medical advisor for The Neuropathy Association. 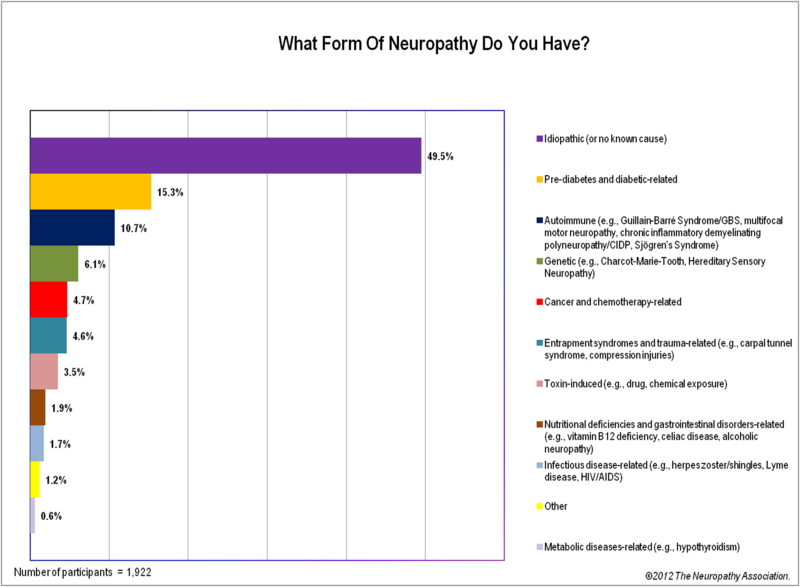 While there are over 100 known types of neuropathy, the poll shows 49% of the patients say their neuropathy is “idiopathic” (an unknown cause). At 15%, prediabetic/diabetic neuropathy is the second most common type reported by patients. Other neuropathy types cited include autoimmune-related, hereditary, cancer or chemotherapy-related, entrapment or trauma-related, and neuropathies related to sources such as toxin-induced, nutritional deficiencies, gastro-intestinal disorders, metabolic diseases, or infectious diseases (including Lyme and HIV/AIDS). “Neuropathy is often misrepresented as only being diabetes-related. We know that diabetic neuropathy typically represents a third of the neuropathy patient community; yet, close to half of the patients receive an idiopathic neuropathy diagnosis. This survey supports the fact that confirming a diagnosis, when possible, requires physicians and patients working in partnership for a thorough evaluation to identify the possible source of the nerve damage,” says Brannagan. 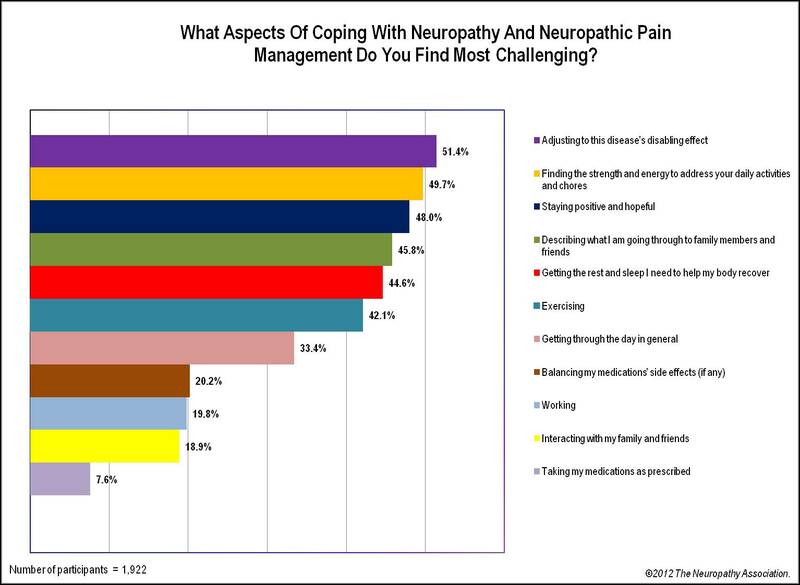 In addition, the survey asked patients about therapeutic management of their neuropathy. Patients say they use a number of therapeutic approaches, with 70% using multiple therapies to address their chronic nerve pain. Nearly half surveyed express that their equally weighted coping challenges pertain to maintaining their overall well-being and their daily interactions. For 17 years, The Neuropathy Association has been an active national patient advocacy organization working to change perceptions about this progressive, chronic neurological disease. May 14-18, 2012 is the eighth annual Neuropathy Awareness Week, an event launched by the Association to promote greater attention to and prevention of neuropathy as a growing national epidemic. Founded in 1995, The Neuropathy Association is the leading national nonprofit organization providing neuropathy patient support, education, advocacy, and the promotion of research into the causes of and cures for peripheral neuropathies through its nationwide network of members, regional chapters, 15 medical Centers of Excellence, and 150 patient support groups.